David Denson left his mark on baseball, but on Monday, he said it was time to move on. The Brewers' Minor League first baseman said he is retiring from baseball to pursue a career as a personal trainer less than two years after becoming the only openly gay player in affiliated baseball. The 22-year-old, who hit .212 in 114 games across two levels last season, thanked fans and friends for their support in a Facebook post on Monday. "I wanted to share something with you that I know some of you may not have seen coming or understand," he wrote. "I want to thank all of you for the amazing love and support over the years. But my baseball journey has come to an end. Even though my baseball journey has ended, a new door is opening and I will continue to push forward!" Denson, who was drafted by Milwaukee in the 15th round of the 2013 Draft out of South Hills High School in California, said he will now be working as a "personal/athletic trainer" in Ontario, California. "I will be taking all that I have learned and I would love to give back and teach others," he said. 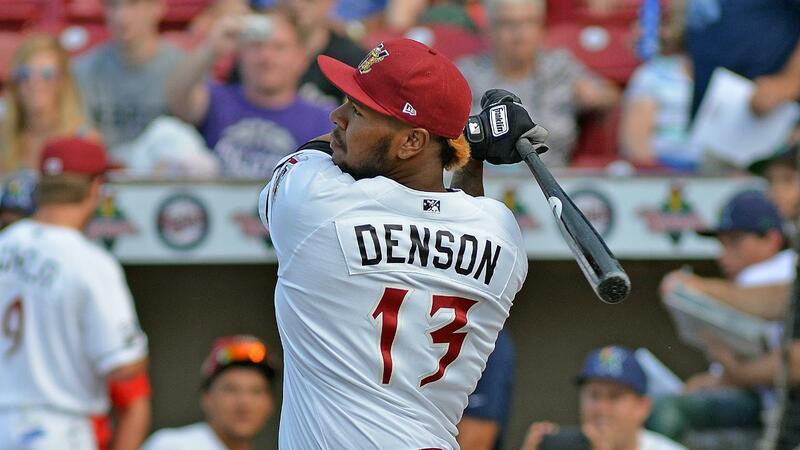 Denson walks away from baseball despite being voted a Midwest League All-Star last year while with Class A Wisconsin. He was the MVP of the Pioneer/Northwest League All-Star Game in 2015 and, after that season, became the first active Minor League player to receive a presidential citation from Minor League Baseball. In four seasons, the lefty-swinging first baseman/designated hitter batted .229 with 29 homers, 135 RBIs, 14 stolen bases, 57 doubles and a .338 OBP in 318 games. He reached Class A Advanced Brevard County last season but struggled, hitting .125 in 21 games. But more than his stats and honors, Denson will be remembered for breaking a barrier few in professional sports have ever done. He revealed his sexuality in an interview with the Milwaukee Journal Sentinel in August 2015 and spoke about the support he received from his teammates. Brewers general manager Doug Melvin called Denson "a very courageous young man" after the announcement. "That was a giant relief for me," Denson said in the interview. "I never wanted to feel like I was forcing it on them. It just happened. The outcome was amazing. It was nice to know my teammates see me for who I am, not my sexuality." Denson isn't alone. Sean Conroy, an independent league pitcher, disclosed his sexuality several months before Denson did. Major League umpire Dale Scott also revealed he was gay in an interview in late 2015. Denson asked fans for their continued support and said he will offer online personal training as well. "If you may know anyone who would like to push [their] skills to the next level, get stronger and faster, or want to get into the best shape they have ever been in, please contact me or refer them to me as well," he said. "I hope you all can please continue to support me and I would love all of you to come along for my new journey in life! Now let's make 2017 your year, and let's get this work!"